RPGaDay Day #4 asks: Most impressive thing another’s character did? Wow. While I have enjoyed the whole business of RPGaDay for the last few years, I find this business of player focus distressing, because I’m not a player (well, distressing might be a bit extreme, but it’s the first word that sprang to mind). Oddly, when I run games I don’t necessarily remember what the players did, well or otherwise. It was either a great game or not. And then I’ll ruminate on whether it had anything to do with me. 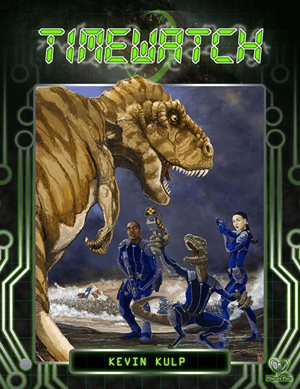 I ran a game of TimeWatch – by Kevin Kulp, published by Pelgrane Press – a couple of years ago where the time agent discovered that someone planned to kill Queen Elizabeth I with a nuclear device, hidden inside a statue. They had a reasonable idea who might be involved, but they needed to intercept a message, which they knew had been delivered some time back. So, they had to jump back to intercept the message to read the content – or possibly influence the content. The first attempt by the agent failed because they got distracted. A second attempt had to account for the presence of the agent the first time around and the fact the failure took place in an alleyway, which he couldn’t now enter. Alas, this also failed. Non-plussed, the player managed to come up with a way for the agent to return a third time, avoiding the first and second instance of their presence, intercepting the messenger and getting a swipe at the villain enemy time traveler who had actually been responsible for the second failure. It was neat watching the players squirm their way through the paradox potential and for the character to come out with a viable plan that worked in the end. Of course, now that I’ve written this out it feels like an impressive thing a player did rather than a character. Maybe I’ll need to go back and correct myself and come up with a better response.